Background: Pulse Wave Velocity (PWV) is the propagation speed of the wave-induced along the aorta and arterial tree, each time the heart beats. PWV increases with increased arterial stiffness, thus establishing it as a reliable prognostic marker for cardiovascular morbidity and mortality. On the other hand, Total Vascular Resistance (TVR) is the overall resistance offered by systemic circulation and pulmonary circulation. This resistance needs to be overcome in order to create the flow of blood through the circulatory system. The goal of this study was to investigate the influence of different cardiovascular factors on arterial stiffness and vascular resistance in CVD patient from eastern India population. Methods: Total of 782 patients with Cardiovascular Disease (CVD) like hypertension, Ischemic heart disease, Congestive cardiac failure and peripheral arterial disease were included to evaluate the cardiovascular hemodynamic and non-hemodynamic parameter by oscillometric method and investigated those factors on PWV and TVR in subjects of both sexes aged between 15 to 87 years. Results: The old age (> 55 years) was found to have greatest impact on PWV as compared with younger age group. Systolic Blood Pressure (SBP), Heart Rate (HR), augmentation pressure and Body Surface Area (BSA) had a positive association with the PWV. Augmentation Index and Body Mass Index (BMI) had a negative impact on the PWV. 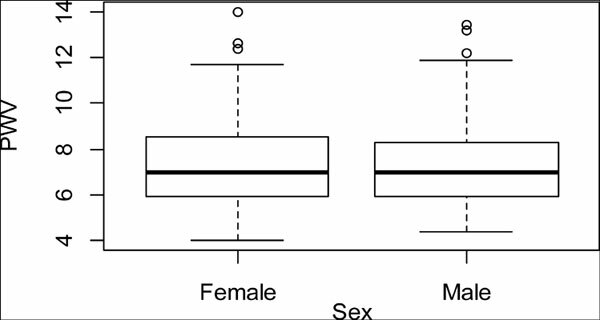 Conclusion: Despite the limitations, like unequal number of male and female participants, wide variation of the age of the subjects and analyzing association of many factors at a time, our large and community-based study show individual blood pressure and pulse pressure depending on complex interaction between large arteries and arterioles. This study sheds light on the relationship between proximal and distal part (PWV and TVR) of the arterial tree as well as their association with different hemodynamic and non-hemodynamic parameters. Keywords: Cardiovascular factors, hypertension, pulse wave velocity, total vascular resistance, BSA, BMI. Keywords:Cardiovascular factors, hypertension, pulse wave velocity, total vascular resistance, BSA, BMI.